This short story, which I've already written, is set in the FAR, FAR FUTURE, where a robotic space probe is exploring as much of the known universe as it can, despite its AI not knowing if its creators--humanity--still exists as a species. The exact number it has calculated to be slightly over a billion years since it first departed Earth. Currently, could a robotic, humanoid space probe (a successor to the Voyager 1) be able to last 1 billion years or longer out in space, as long as it doesn't take on any external damage? If so, I'm curious what kind of materials don't deteriorate over time? 50 years is probably about the limit of what is achievable right now, and a billion years is just too, too much longer than that to be reasonable. What if it doesn't have to "last" that long at all? Von Neumann Probes have been the stuff of sci-fi for decades. Have your spaceship stop in various systems, harvest new materials, repair itself, and move on. It's basically a gigantic factory, flying through space stuffed to the gills with spare parts. The nice bonus for a short story is that now your AI can ponder if it has become "life" given that it grows, experiences the universe, and perhaps even procreates. How does this affect its relationship with the long lost human race? where $t$ is time seen by stationary observer, $v$ is velocity, $t_0$ is time in rest frame, and $c$ is speed of light (&approx; 2.998 × 108 m/s). We'll get a dilated distance of ~44.70. So that means that if you make the robot accelerate to 99.9999999999999% of the speed of light and make it travel for 44.7 years (or 391570 hours) from its point of view, roughly a billion years will have passed for a stationary observer. 45 years seems to be a reasonable amount of time to keep a particularly sturdy robot operational. I have to agree with others: self-repair is your only hope. Everything wears out, given enough time. You may want to see how other authors have addressed this. Robert Silverberg thought it could be done, in Across a Billion Years, but I don't recall that he specified how. James Hogan pointed out how self-repairing AIs might go wrong in Code of the Lifemaker. Meanwhile, Robert Moore Williams wrote in "Robots' Return" of a future so far that Man had become a myth among the robots. The Centennial light is the world's longest-lasting light bulb, burning since 1901. Electronic and/or electromechanical devices have been in use for less than that, but none of them has shown a lifetime longer than a few decades. Currently, could a robotic, humanoid space probe (a successor to the Voyager 1) be able to last 1 billion years or longer out in space, as long as it doesn't take on any external damage? Even if this device took no damage, which is already a far-fetched assumption, considering how "nice" space is (high energy photons and particles, strong magnetic fields), we have no power source which can supply energy at an appreciable level for such a long time span. The only thing which has been able to self sustain for a billion years has been life as a whole, but it doesn't stand up in the environment of space. Have your robot based on crystals. A tiny 4.4-billion-year-old crystal has been confirmed as the oldest fragment of Earth's crust. 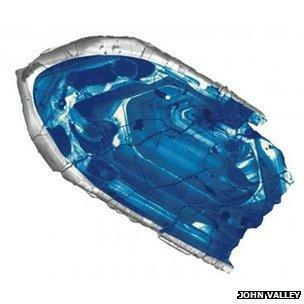 The zircon was found in sandstone in the Jack Hills region of Western Australia. Scientists dated the crystal by studying its uranium and lead atoms. The former decays into the latter very slowly over time and can be used like a clock. Your robot uses solid state electronics based on zircon crystals. These are durable on Earth for billions of years and so with a modicum of shielding should do for your spacefarer. Extremities, probes and other moving apparati will probably be manufactured new for each solar system visited but the main program of the robot and its memory will be as immortal crystals. Your biggest problem is going to be entropy and redundancy. Entropy pretty much guarantees that anything, given enough time, will gp through molecular changes from the original. Atoms will migrate through the material, any exposed surface will diminish through vapor pressure, 'pure' substances will always become less pure, and after a billion years you will not have anything at the atomic level close to what you started with. So systems will have to be redundant to the extreme. Then, you have quantum effects. Quantum tunneling and indeterminacy. How do you prevent this from happening in critical systems? And, of course, there is radioactive decay. Elements change in physical properties as they go through such basic changes as emitting radiation. So is a billion years enough time for all of these things to affect critical systems? With today's level of technology, absolutely a certainty. No robotic system that we build will last a billion years. Consider recent history. As humans endeavored to reduce the size of computer chips, the first pentium processors began to suffer terminal illnesses. Turns out, the copper traces were so thin (atoms wide), that as high frequency electrons flowed through them and coursed around sharp corners, the electrons 'shortened' their path by rounding the corners into curved ones, and they began to short out on the traces beside them. Just the act of sending an electrical current through a copper wire is enough to cause it to change shape. So any computer chip microprocessor today is extremely unlikely to be operational in a billion years. It will be one huge mass of electrical shorts and cross signals. At most, it is extremely unlikely that any pentium processor in continuous use will last a hundred years without the circuits degrading enough to produce just random garbage in the data. Even twenty year old chips can no longer be relied upon in critical applications. Probably, but not by accident. and focus on machines that are recognizably analogous to probes humans have already launched into space. In general, simpler devices will function longer. A probe designed for a 100-year mission, or even a 1k-year mission, would not still work after 1G-years, because its designers would have had no reason to make the kinds of compromises to the probes capabilities that would have been needed. For example, they would have wanted a smarter AI (requiring silicon transistors or similar electronics that degrade naturally on extreme timescales), more sensitive cameras (which would be more easily burnt out), or more powerful thrusters (which would have their own problems, and would add stress to all the other components). A machine that was still operating after 1Gy would be simple to the point of idiocy. A camera? How about a single directional photo-sensor. We'll just sweep it across the sky to build a picture. We can refract the input and adjust the lens a little to get color. Thrusters? How about we adjust a big electromagnet against the magnetic field of the nearest star. Might work if we plan our trajectory a millennia in advance and aren't too picky about where we're going. An AI? Willk's answer is ok, but the electronics will still need to be over-built by a factor of a thousand. "Solid state" electronics do have moving parts: The electrons move back and forth, smashing into atoms. The atomic lattice jiggles around; defects form, heal, and move. Dopants diffuse. I think you can have a computer, maybe even an "AI", but it will be physically large, dumb as bricks by it's maker's standards, and slow. Landing gear? Tools for making spare parts? NO! Absolutely not! This probe will never come within 30AU of a star, and will prioritize avoiding any close passes with any objects or phenomena. Even in principal, is it possible for a machine to last a billion years? I still think it is. Consider the surface of Ultima Thule. As long as the probe stays well away from all the excitement of inner solar-systems, space is a nice relaxed place to pass the eons. Sure it can. Every critical system must exist in multiple copies and the robot must be capable of manufacturing replacement parts when it finds accessible raw material (say, an asteroid that it can land on.) You can make a robot with any desired mean time to failure by application of sufficient redundancy. In the extremes your "robot" is really a swarm, anyone of which can rebuild the whole swarm if need be. The robot spends a lot of time checking it's data for errors and repairing corruption from other copies or from error-correcting codes. A swarm approach actually makes repair easier as it means you can go with total replacement on some suitable timescale, thus avoiding headaches caused by transmutation-induced weakening of parts and the slow evaporation that happens to everything. The chances for a modern day space probe to survive for 1 gyr and be anything but a metalrich asteroid are quite slim. How slim exactly depends on its speed and that it doesn't run into any big debris out there. While debris are rare and space is quite empty there is always a chance for bad luck. Speed and time are the factors here. If you plot a smart course with several solar flybys a few percent of lightspeed are on the table. Needless to say that this makes collisions way worse as Ekin = 0.5 * m * v^2. Even a few atoms might degrade the probe significantly at high speeds. Of course lower speeds could help, yet I assume you want the probe to get somewhere within 1 gyr. I'm not an expert on radiation induced material fatigue. Your probe will most likely suffer mostly from cosmic rays, but especially during solar flybys charged particle radiation will be an issue. Assume that the material will wither away over the eons. Your worst issue on the radiation front will be the breakdown of computers though. Look up the design of computers on mars rovers like opportunity for example. Less probable yet more intriguing story whise is data corruption. The mission (given more complex ai and some freedom to take decisions) statement might be "explore milky-way"; have some freak data corruption turn a r into a d and you have "explode milky-way". (Not very probable but an ai will do anything as long as it gets the reward circuit tickling). So the answer is no. BUT there might be a solution, albeit one using slightly future technologies. Don't aim for longevity, aim for maintenance. Pick a big (maybe 10 to 100 m diameter), metalrich asteroid and turn the whole thing into a probe. Reinforce it structurally to get meters of radiation and impact shielding. Have huge databanks and really smart or slavishly dumb, yet specialised AI. Most importantly you need manufactories capable of producing anything on the asteriod probe and redundancies for every system. For power you could employ a number of technologies. Nuclear reactors, (fusion or antimatter if available), radioisotope generators with an isotpe with a long (the desired mission time) half live, or solar panels during stellar flybys (you want to keep doing those as they counteract drag or slow you down if the system is interesting) (keep in mind that you can manufacture solar panels once you approach a system so the won't degrade). Generally beeing really conservative about using power will be helpfull as well. Let the probe hibernate during inter system flights and let it do the repair and exploration near stars where there is free energy and something to do. Now you might wonder how to move such a kiloton behemoth to interstellar velocities, yet thats not so hard. Huge lightsails, laser thermal rockets, nuclear rockets or even ion drives will move it eventually. Then you simply need to plot a very smart flyby course arround moons planets and suns and you might cruise of at a not insignificant portion of lightspeed. Astronomer Paul Birch once said that one could theoretically throw a pebble into the asteroid belt and end up crashing mars into the sun. Now even such a maintenance probe will run out of some resource (energy, ejection mass or raw materials) eventually or might degrade from collisions. (Come to think of it manufacturing, a huge thin mirror arround the probe when in a system seems highly beneficial. Use it as a high resolution telescope to scout out the system and the route ahead and use it as a solar sail to save ejection mass to get into an optimal gravity assist.) It is very conceivable that such a probe might survive for a billion years. Most people won't know this, so publish your story anyway - I'd read it. Many people know that "Transistors don't have moving parts,"
but then wrongly believe that implies: "so they never fail." Transistors built 50+ years ago are likely still working fine today if they were cared for properly, and may be expected to work without issue for 1,000 years in the future (maximum life approx 10,000 years). Let's ignore the additional problems of traveling through space for even a century - as most of those (radiation/power/propulsion) are insurmountable given today's knowledge. A probe that is 'smart' enough to be called AI would likely be based on current technologies. Modern chips have very very small transistors with very very small connectors. Part of the reason that integrated circuit voltages have gone down is that the smaller the "wires" the more troubles you have, like electromigration (as the device is used, current flowing through the circuit causes the metal to actually move around which can form opens or shorts in your circuit). As transistors get smaller, you see problems that weren't even known recently such as Hot-carrier injection (where the switching characteristics of the transistor can be permanently changed). "Over time, charge carriers... with a little more energy than the average, will stray out of the conductive channel between the source and drain and get trapped in the insulating dielectric. This process, called hot-carrier injection, eventually builds up electric charge within the dielectric layer, increasing the voltage needed to turn the transistor on. As this threshold voltage increases, the transistor switches more and more slowly." A slowing of switching (your probe's computer computes slower) and a need for increased voltage (your probe's power consumption increases over time) spell doom for a "real science" answer to a space probe that lasts a million years. I will restate my opinion that your stories do not need to be completely based in 'real science' to be enjoyed. Interesting question; this timeline will probably cause your craft to encouter issues never before seen. You will need some sort of material that is not easily affected by radiation. Perhaps Tungsten would be a good material for your craft's shielding? Tungsten is the densest metal on the planet. Also, we currently struggle with computer memory degradation for long term storage, our best and most stable storage devices currently are, oddly enough, clay pots and magnetic tape. Crystal based memory has shown good potentiality for overcoming those challenges. Superman style crystal memory storage. Think of the Fortress of Solitude. The storage method enables up to 360TB of capacity on a disc about one-inch in diameter that can withstand temperatures of up to 1,000 degrees Celsius and has a virtually unlimited lifetime at room temperature (13.8 billion years at 190 Celsius). Not the answer you're looking for? Browse other questions tagged science-based science-fiction space space-travel robots or ask your own question. Can a robot track someone by their DNA? Can a 3-laws compliant robot create a non-3-law compliant robot?